EFUNDRAISING, February 14, 2007  You just learned that you were put in charge of the band's fundraising for the coming year. No need for despair! There are new, exciting and easier ways to raise money these days. The World Wide Web has helped many groups meet their fundraising goals through a whole new generation of fundraising programs. Online fundraising is set to take center stage in the fundraising industry. To keep you in the know, here's a look at some frequently asked questions about online fundraising. Online fundraisers take many different forms, but you'll generally find them to be either purely online, or hybrids that incorporate online components with traditional programs. Some fundraisers take place entirely online. Usually, the company you're working with provides an online fundraising store, which you register for and personalize online. With a purely online fundraiser, your promotion can also take place online. Some companies will list your store on their website's main directory so your supporters, friends and family can find your store. Some programs allow you to send email invitations to your supporters so they can simply click a link to begin shopping in your online store. A good online fundraising company will provide online reports to show how much you sold, which students participated, and how much profit you made. You typically receive profit checks on a monthly basis either through a service like PayPal, or through regular mail. 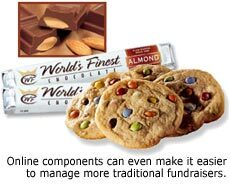 Even traditional fundraisers  such as selling chocolate candy bars  incorporate online components that make managing the program easier. For example, as the fundraising manager you might use the company's website to place your product orders even though the products will actually be sold offline. What will I be selling online? The products in your online fundraiser will vary depending on the company you work with. Some programs offer a wide variety of products (like a department store), some just one or two products (like a specialty store), while others allow you to choose from a list of products or stores you'd like to promote (like a shopping mall). You typically earn a higher payout from programs where you sell one or two products. This is because the company will likely have a special deal with the supplier allowing them to purchase products at a lower cost. 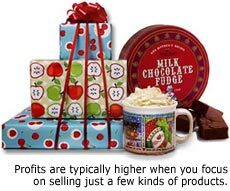 The benefit to you and your supporters is that you can earn a solid profit without having to sell over-priced products. How do my group members participate? For companies that provide a built-in email feature, group member participation is a breeze. You send emails to notify your group of your fundraising campaign launch, and then your group members send email invitations to their friends and family. The invites include links so supporters can easily access your store and make purchases. The idea is similar to the "tell-a-friend" feature you find on many websites and newsletters. If you're working with a company that does not provide a built-in email service, you'll still want to use email to help publicize your campaign. When you send your store's link to family or friends, be sure to include the full web address exactly as it appears in the address bar when you visit your store online. This is to ensure that all sales will be properly credited to your organization. The downside to creating your own emails is that these companies cannot track group member participation for you (and it means extra work on your end!). Companies with built-in features can usually provide you with reporting that shows which of your group members have participated in the fundraising campaign. Are they certified by a third-party organization? Look for logos from organizations like Thawte and VeriSign. These logos mean an outside organization has declared the website secure. Do they ask for your credit card number when you try to register? Unless there's a cost to register, there's absolutely no reason the company needs your credit card number. If you're not making a purchase, and they ask for your credit card number, find another company! If there is a cost to register, you should consider finding another company anyway. There are many great fundraising companies that offer their online programs for free. Are they a well-known company? Ask people you know if they've ever worked with the company, or know of anyone else who has. There are also many online forums that discuss fundraising programs and ideas, as well as the different companies that provide them. Look around the company's website to see if they are affiliated with a larger, better known company. Can I actually raise money with online fundraisers? Online fundraising is becoming more popular because it actually works. If you aren't convinced, most online fundraisers are free, so you aren't risking anything to try it. Keep in mind that your main job with an online fundraiser will be marketing and promotion. Your family and friends need to know about your fundraiser so they can support it! You might consider running a traditional fundraising campaign (for example, a cookie dough sale) alongside a free online fundraising campaign. The money you raise online will be icing on the cake! In short, there's a lot of potential in online fundraising. The payout to you could really boost your next fundraising campaign! Marching.com has partnered with eFundraising.com (a subsidiary of QSP Reader's Digest) to help bands across the nation reach their fundraising goals. The company offers a free online magazine fundraiser which boasts 40% profit for your group, a built-in email feature, and reporting to let you track sales and participation. They also have a large selection of traditional fundraising products including chocolate, lollipops, scratchcards and cookie dough. Request a free fundraising guide or call 1.800.860.9241 to speak to their consultants who can answer questions and help you decide which fundraising options are best for you.